← Morristown, Tennessee. June 20th, 2011. Lyman County, South Dakota. June 21st, 2011. Two die in huge, deadly sinkhole. It doesn’t look like it should be real. But it happened Tuesday morning in Lyman County. 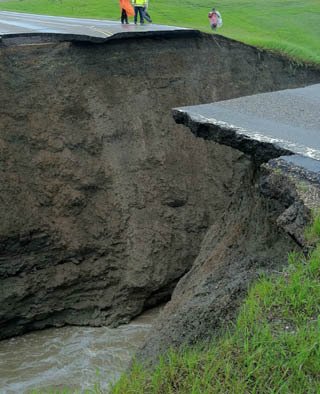 Heavy rains triggering a sinkhole which swallowed two vehicles and ended up claiming two lives. All of it unfolded about 10 o’clock on Tuesday morning in central South Dakota. The area in question is a highway just north of Reliance. Torrential rains led to high water near the highway and that water weakened the road, creating a sinkhole. Longtime Lyman County residents tell us they’ve never seen anything like this. All that remains now of tribal Highway 10 is a canyon as flash flood water carved their way through Lyman County. Water poured over the road and two drivers attempted to cross the flooded roadway, not knowing that the ground beneath it had been washed out. The driver of the van has been identified as a 56-year-old Chamberlain woman and was found by emergency responders dead inside her vehicle. And do their best to prevent tragedies on the road from happening again. 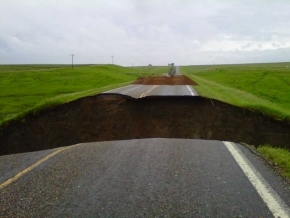 This entry was posted in Pictures, Vehicle v Sinkhole and tagged deadly sinkhole, Lyman county sinkhole, massive sinkhole, sinkhole, South Dakota. Bookmark the permalink.